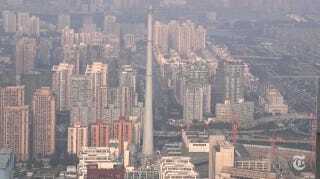 China is already home to some of the most quickly growing megacities in the world. Now there’s a plan to officially merge several megacities around Beijing into one super-megacity that will house the equivalent of a third of the US population in an area that’s the geographical size of Kansas. The New York Times accessed planning documents that showed how Beijing is planning to move most of its government operations and factories to the fringe of the city and accelerate development to connect these nodes to other nearby cities. The goal is to create a dense metropolitan area called Jing-Jin-Ji which will be not as much a megacity as it will be an economically united megaregion. It would be spread over 82,000 square miles, about the size of Kansas, and hold a population larger than a third of the United States. And unlike metro areas that have grown up organically, Jing-Jin-Ji would be a very deliberate creation. Its centerpiece: a huge expansion of high-speed rail to bring the major cities within an hour’s commute of each other. Infrastructure has also lagged. Until recently, high-speed rail failed to connect many vital cities around Beijing, while many roads did not link up. Planning reports say the area has 18 “beheaded” highways — major arteries built in one of the three districts but not linked to others. One highway ends at a bridge over the mostly dried-out river dividing Yanjiao from Beijing, and has remained unfinished for years. The plan calls for eliminating the “beheaded highways” by 2020 and constructing a new subway line. In addition, the plan assigns specific economic roles to the cities: Beijing is to focus on culture and technology. Tianjin will become a research base for manufacturing. Hebei’s role is largely undefined, although the government recently released a catalog of minor industries, such as wholesale textile markets, to be transferred from Beijing to smaller cities. Many of the high-speed rail lines needed to connect the region are already under construction, as are miles and miles of towers needed to house workers moving to the area. Although other countries have plans to build megacities from scratch (Turkey, for example, is deciding on a site for its brand-new economic center) Jing-Jin-Ji has both political momentum and financial backing to make it happen. The plan has the support of President Xi Jinping and would get a huge boost if Beijing (more specifically, the nearby mountain city of Zhangjiakou) is awarded the 2022 Winter Olympics. Or perhaps they’ll be named the Jing-Jin-Ji Olympics.